While BYGL Alerts are intended to provide fast-hitting information, sometimes it's important for us to take a little more time - and space - to dig deeper. Our Southwest Ohio Diagnostic Walk-About group visited Stanley Rowe Arboretum yesterday and revisited an interesting nutrient deficiency problem that was observed by the group on Colorado blue spruce during our Walk-About last year. As shown in these images taken last season, the trees had a very peculiar pattern of inner needle yellow (chlorosis). Stem growth rates for all years appeared normal and the current season's foliage was a beautiful deep silvery blue. However, needles on all previous year's growth were yellow; sometimes an intense aureolin (= cobalt yellow) color. A close examination of the chlorotic needles revealed that on some needles, particularly those on last season's growth, had faint green horizontal banding. The exact cause for the peculiar symptomology was revealed after Chris Daeger, Manager of the Arboretum, sent both soil and needle tissue samples to CLC Labs in Westerville. The wisdom of having both a soil test and needle tissue analysis performed became evident when the two results were combined to arrive at an accurate diagnosis and a correct cost-effective course of action. The Soil Test: the soil test provided several helpful pieces of information as well as one possible "red herring." First, the soil pH was 6.8 which was very surprising given the propensity for soils in southwest Ohio to be alkaline. This provided a clear demonstration of the value of having the soil tested rather than relying on "conventional wisdom." The pH value eliminated the likelihood that soil alkalinity or acidity was making a nutrient unavailable to the spruce trees. Second, most micro and macronutrients were in an acceptable range except for Manganese (Mn), Zinc (Zn), and Phosphorus (P). These plant nutrients were all at the very bottom of the "low" range; however, the soil test alone did not answer exactly which nutrient was responsible for the needle chlorosis. Also, since P is a macronutrient meaning the plant has a higher usage rate compared to micronutrients (e.g. Mn and Zn), the soil test results alone may have led to the conclusion that a P deficit was the culprit; a red herring. The Tissue Analysis: this test revealed that P in the needles as actually "sufficient" meaning that despite the low level of P in the soil, the tree was managing to extract a sufficient amount to provide for the needs of the foliage. Of course, the low P level in the soil must still be addressed with targeted applications. All nutrients were found to be sufficient in the needles except Zn which was "Low" (result 32; normal range 35 - 65) and Mn which was "Very, Very, Low" (result 129; normal range 500 - 1000); the true culprit was revealed! The Mn deficit in both the soil and the foliage also fit with the observed symptoms. This nutrient behaves in an odd way in spruce. If Mn is deficient, the tree will rob Peter to pay Paul by shifting Mn from the older foliage to the new foliage, thus producing both the chlorosis and the odd green banding pattern observed on the older needles. There are two important take-home messages from this case study. First, as Chris noted when he reviewed the soil test and tissue analysis results, he now had a clear pathway for correcting the chlorosis condition and keeping his trees healthy. While the soil test and tissue analysis cost time and money, without the test results, he would have been shooting in the dark and spending time and money hoping he hit the target! He has purchased and made an application of the recommended nutrients; the trees have improved, but are not yet out of the woods. It often takes time to correct a severe nutrient deficiency. 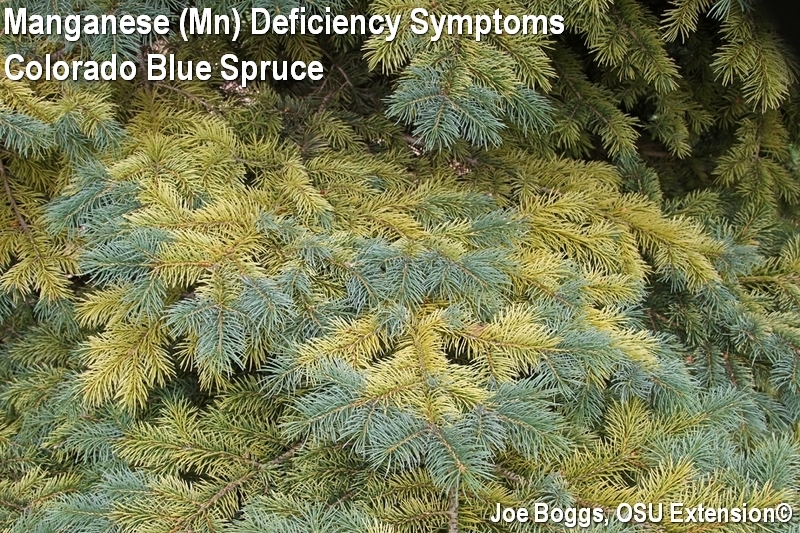 Second, does this case study demonstrate that inner needle chlorosis on blue spruce is always caused by a Mn deficiency in the soil? No! While the symptoms may match a Mn deficiency, without a soil test and a tissue analysis, there would have been no way to know exactly what was going on. Was the soil deficient or was a high soil pH making Mn unavailable to the spruce trees? What would have happened had Chris made an Mn application along with a sulfur application to drop the pH? This is dangerous ground because excessive Mn can be highly toxic to plants! The soil test and tissue analysis combined illuminated exactly what was going on. Both played a vital role in plotting a cost-effective - and safe - course of action to solve the problem. Don't guess …test!